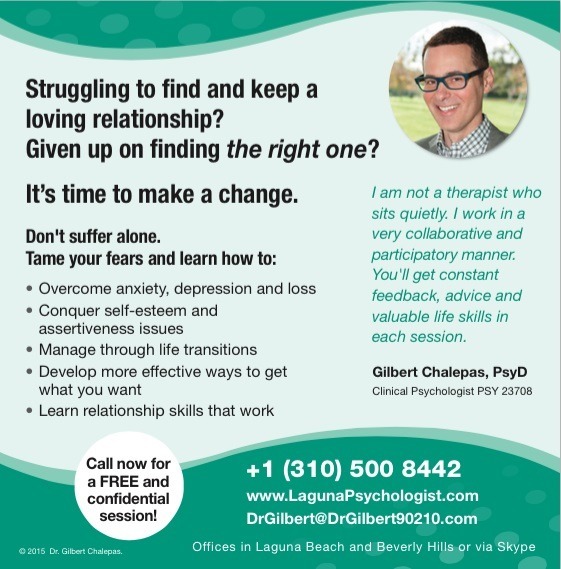 Dr. Chalepas offers an initial session which is a great way to have a clear understanding of how he works with you. He strongly believes that no one should suffer alone. Friends are a wonderful part of life, however, at times, after multiple attempts, they are still unable to provide you with what you really need. That’s when it’s time to contact a licensed Beverly Hills therapist like Dr. Chalepas, who is an objective and trained professional who provides honest, confidential and compassionate feedback. *To qualify for individual psychotherapy or one of the groups, you must participate in a complimentary phone or Skype session to ensure individual or group psychotherapy is a right fit for you. These links are being provided as a convenience and for informational purposes only; they do not constitute an endorsement or an approval by Dr. Gilbert Chalepas of any of the products, services or opinions of the corporation or organization or individual. Dr. Gilbert Chalepas bears no responsibility for the accuracy, legality or content of the external site or for that of subsequent links. Contact the external site or organization for answers to questions regarding its content.